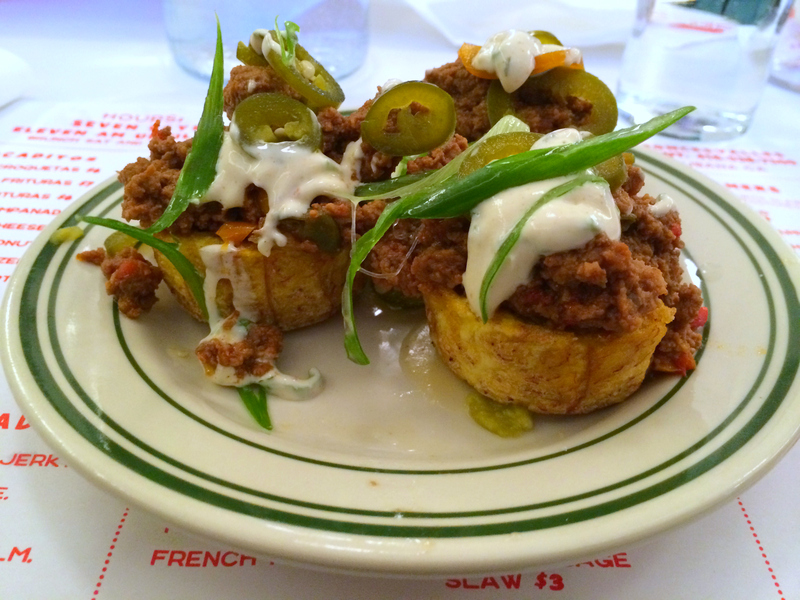 Crispy twice-fried plantains topped with picadillo-seasoned minced beef, crema, green onions, and jalapeño peppers. I spent a year in Havana at the end of the Special Period. Only the absolute bare necessities were included in monthly food rations at that time, so creating delicious traditional Cuban food was a challenge for most Cubans (it’s hard to make magic in the kitchen using standard issue vegetable oil and no spices). Even a simple dish of moros y christianos (black beans and rice) typically only included a small handful of beans in proportion to a much larger quantity of rice, and the few people still making arroz amarillo Cubano (Cuban yellow rice) did so only on very special occasions using smuggled seasoning packets containing yellow food coloring (as saffron was obviously not included in the list of necessary food rations). Beef has been virtually unheard of in Cuba since the early days of the Revolution, but tostones were one of the dishes for which the ingredients (plaintains, oil, salt) were readily available and made frequently at the houses of my friends and relatives. The plantains are fried in vegetable oil on both sides, then removed from the pan, flattened, dipped in water, salted, and fried again. The tostones at La Cubana in Toronto’s Roncesvalles Village are true to form–crispy and salty with a soft inside, and topped with an incredibly delicious beef picadillo that is tempered by the tasty crema then heated up again with the jalapeños. The resulting mixture of flavours and textures is mouthwateringly good. Things have improved on the food front for Cubans over the years as the country’s relationship with Venezuela has strengthened, but making beef picadillo or crema is still not an option in most Cuban households or even restaurants. If in fact there are any cows in Cuba they are scarce, and milk rations come in powder form–so these and many other ingredients are still extremely hard to come by. Paradoxically, for now, the only place to find a dish like this is anywhere but in Cuba. love that I never know what I’m going to find here! Those tostones look good. What a fantastic combination of textures and flavors. You’ve featured many different types of ethnic foods here–do you have a favorite?